My guy and I attend a lot of music festivals together. So, in honor of our summer trips (Bonnaroo and Pitchfork), I made him a usb-mixtape. They look like those old cassettes we used to spend hours recording for potential boyfriends, crushes, or best friends. But, these have a nice little usb pop out, making listening in the 21st century a zip. 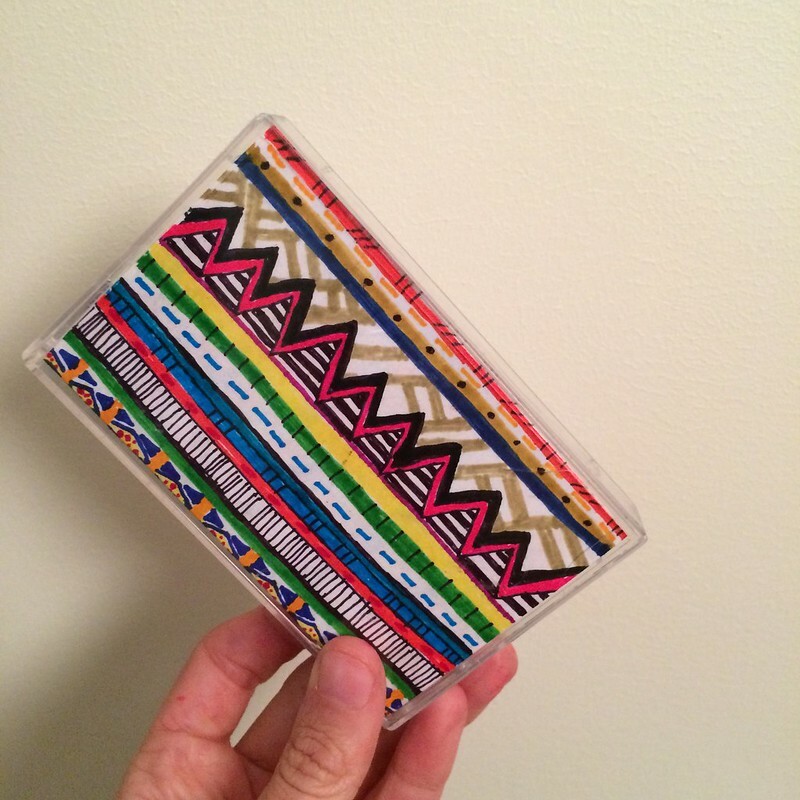 This cassette cover is hand drawn, inspiration in geometrics from my sketchbook. 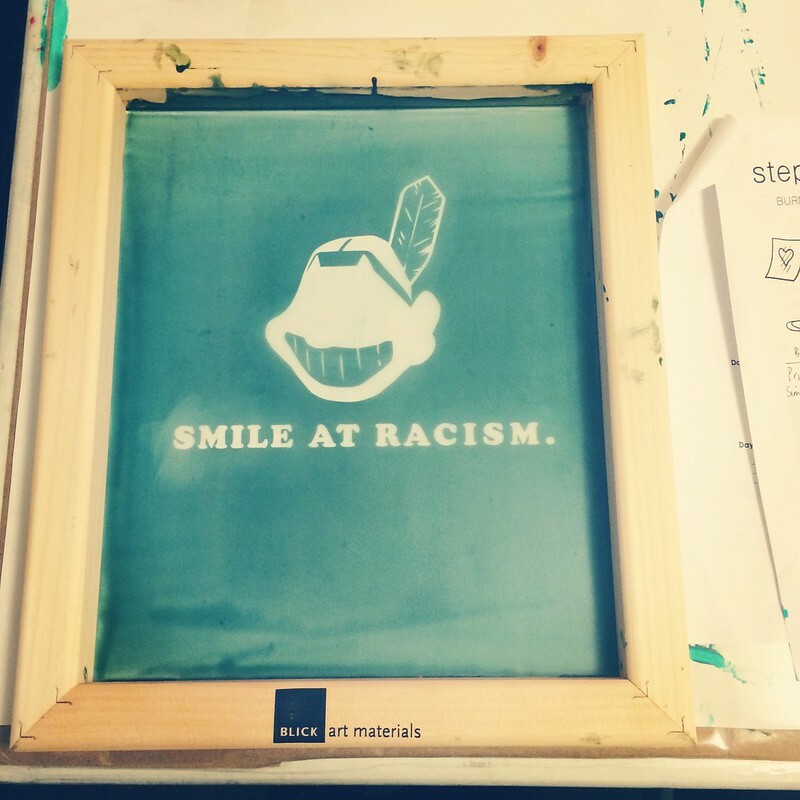 I took an amazing screen printing class at Gather Here back in June. 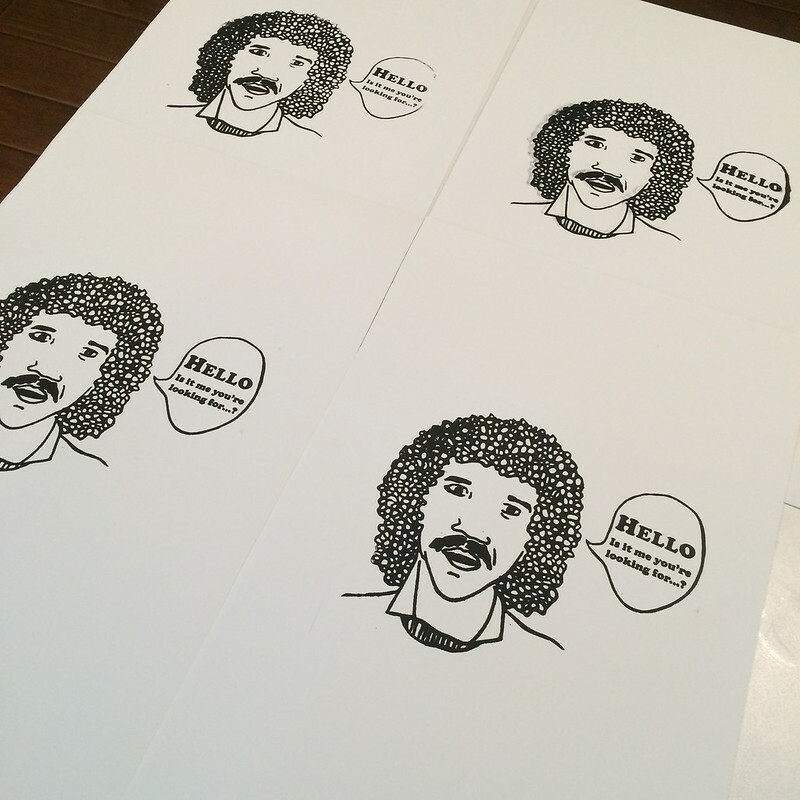 Since then, I’ve burned a second screen, using an old drawing of Lionel Richie I once did for a card. Since I went to Bonnaroo Music Festival this summer, and Lionel killed the main stage on Saturday night, I figured it made sense to take that old drawing and see if it tanslated into a tshirt for my Bonnaroo crew. I did, certainly, do a ton of test prints before I risked tshirts. As you can see, it was necessary! While it is definitely not an easy process the first time you are on your own, its so worth it. Conditions in my apartment seem to be really humid, which means I need to allow for more emulsion drying time and a bit of a longer burn. Now that I know this, I feel like I’m already planning out a million more designs to screen print. Check out more snaps of the screen printing process, as well as us wearing our tshirts, at its flickr set. I’m not into frilly coffee drinks. I take mine black, straight up, no add ins. I’m not picky about my coffee either. If its there, I drink it. I certainly appreciate the best of coffees, but let’s just say, I can’t live without it, and so I’ll get it any way I can. That being said, some days, you just need to shake things up a bit. 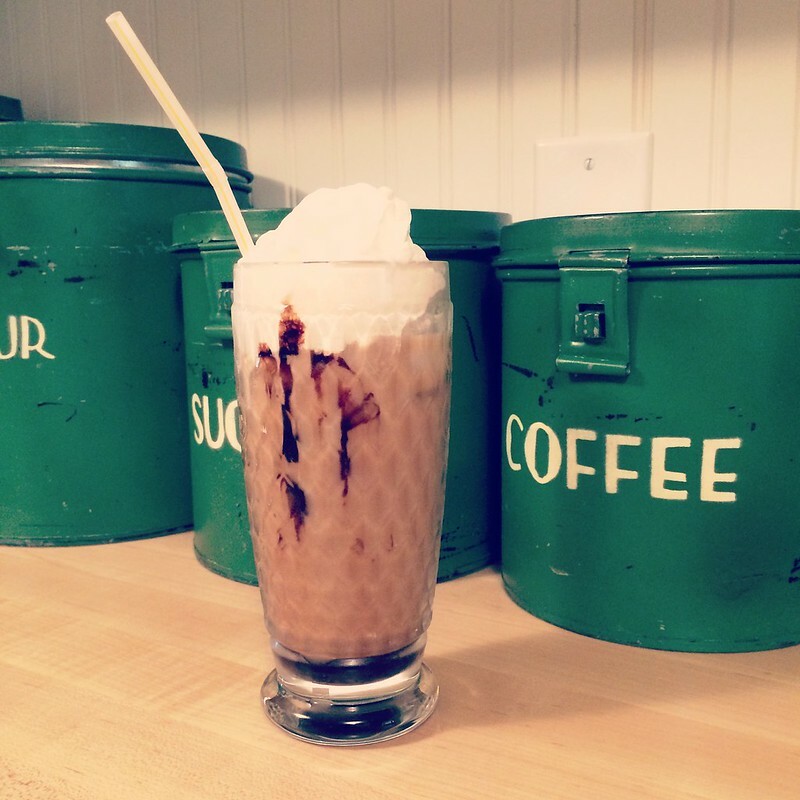 Here’s my version of a homemade iced latte type drink. Just a touch of cream in the coffee, a swirl of chocolate sauce, and some whipped cream on top. If you don’t like crazy sweet things like me, this is the way to make your summer afternoon coffee a bit more like dessert. I bleached some old cut off jeans I had, then dip dyed them in green and pink dyes for a watermelon feel. But nothing screams this fruit without a few seeds–hand drawn on with fabric dye markers. Something fun to do with old shorts in your wardrobe; gives them a lift for summer. And since Beyonce’s surfbort/watermelon is so hot this year, make these your DIY project of choice. 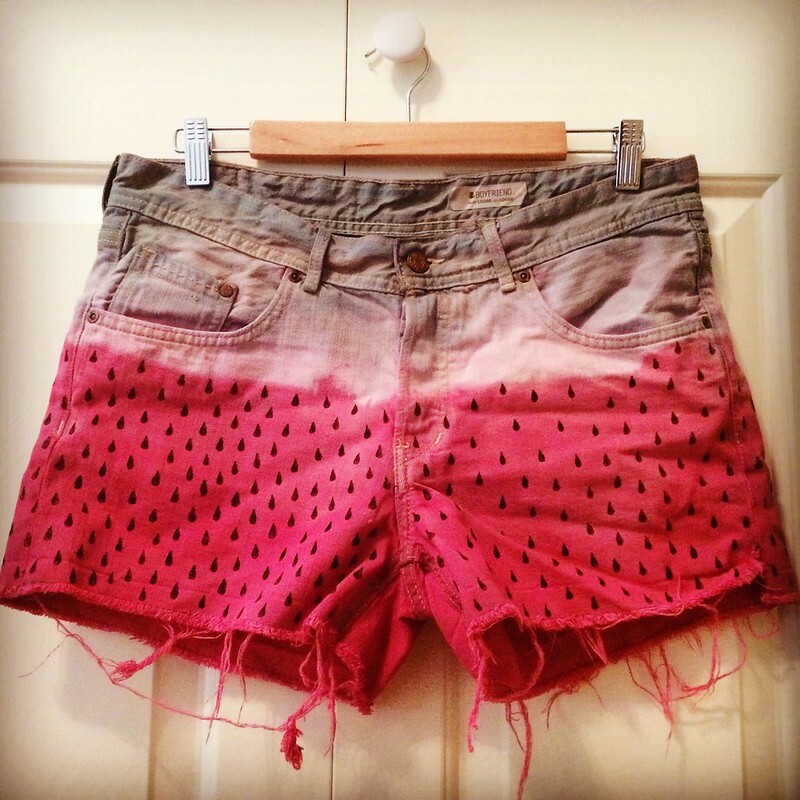 These old cut offs of mine that I wasn’t wearing much will soon become some amazing hand dyed watermelon shorts. Once I saw someone do this, I had to jump at the idea. With Bonnaroo Music Festival next weekend, it seemed like the perfect time to reinvent some old items in my wardrobe. So watermelon shorts these will be. 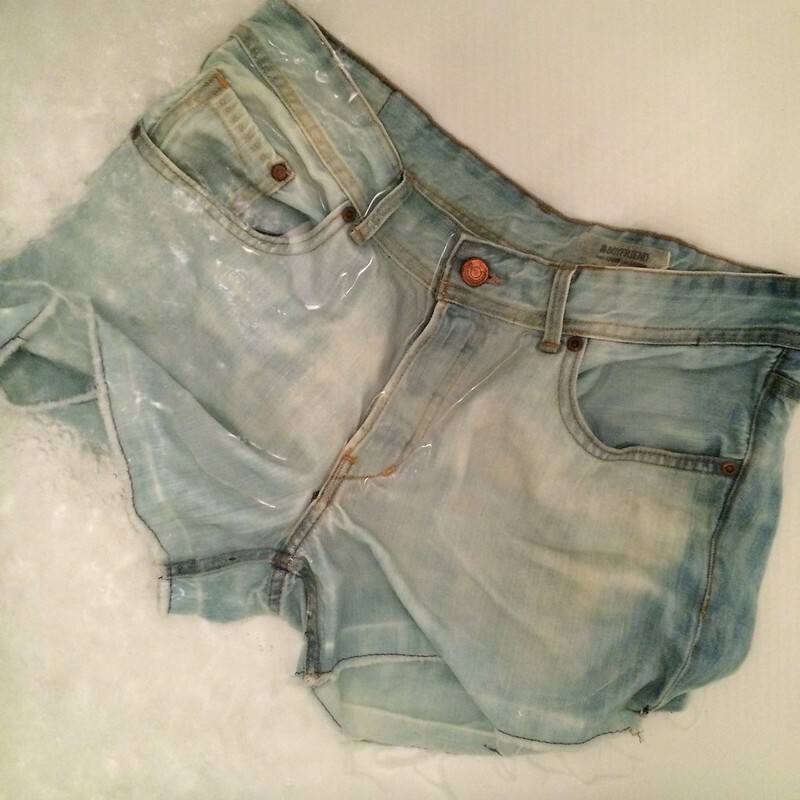 Soaked the denim shorts (which were pretty dark) in two inches of bleach for a couple of hours. This is what they looked like when I rinsed them. 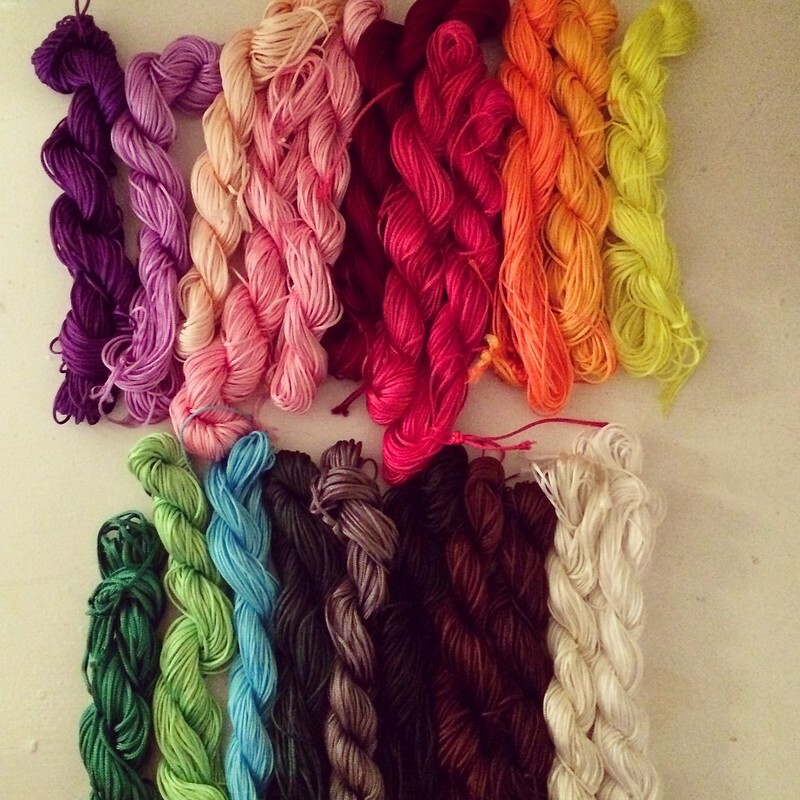 Once they finally dried, they were basically white, which is what I was looking for before the dyeing process. This is my first attempt at bleaching denim and it was a huge success. Stay tuned for final snaps of my shorts! Some brightly colored Chinese knotting thread to make these festively summery bracelets I saw the other day over at Purl Bee. The combinations are endless! 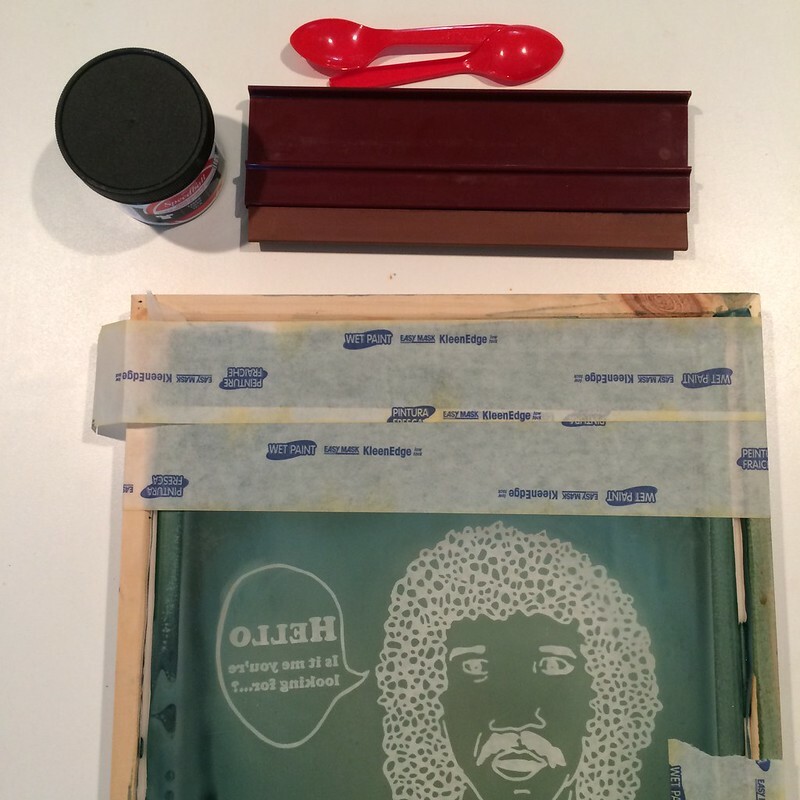 I took a screen printing class, held last week at my favorite handmade heaven, Gather Here, and taught by the brilliant Sarah Coyne of Eggagogo. Not only did I learn how to burn my own screens using a photo emulsion process, I got to print my first designs on fabric, a t-shirt, a tote bag, etc., and take it all home with me. Since then, I’ve bought all the necessary supplies to continue this maker adventure–screens, paint, reptile light to burn screens, photo emulsion, you name it. You can see more of my screen printing work here (the set of photos is still light in its loafers, but give me some time to get going). Tonight, I’m set to burn a new screen, but the project has to stay a secret, for now, because its a surprise for friends on our impending two week camping trip, starting next week. Stay tuned. I made these peyote stitch beaded earrings for a graduating senior of mine. I think they fit her unique style, are hip to my own style, and will be greatly appreciated. I haven’t done enough beading lately. I have too many maker interests, and so, something has to give. I go through fits and spurts with a particular craft. But, I should do more of this. You can see more of my peyote style beading projects here. 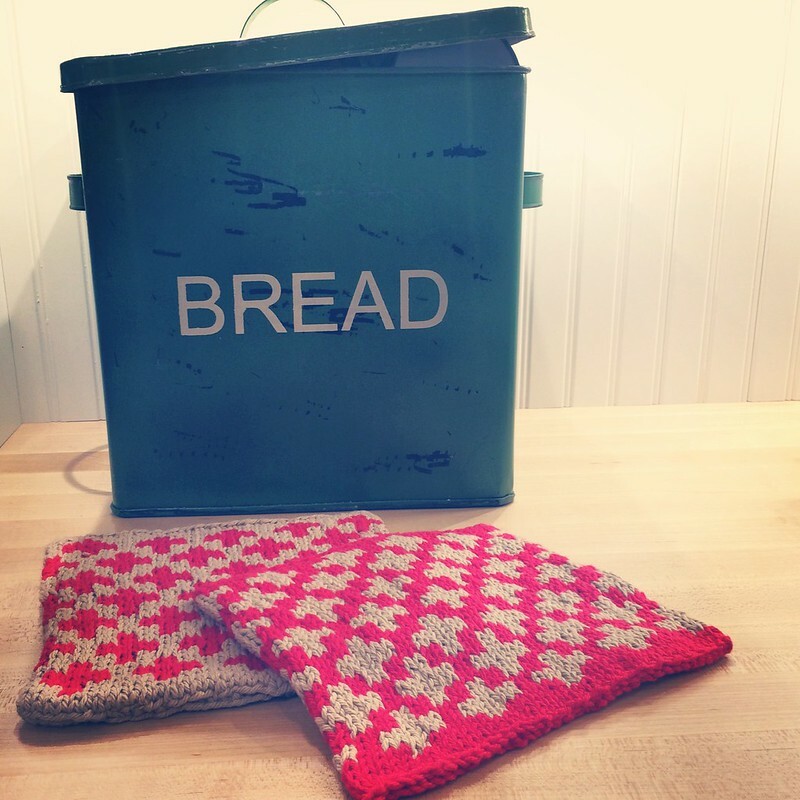 I’ve knit a bunch of these Toasty potholders for mine and friends’ kitchens. They are so quick, easy, durable, and beautiful. These bright red and tan ones were recently gifted to my mum for her newly renovated lake kitchen. I like how bright they are; and how vintage they feel. See other versions of my toasty potholders here. And here.